There are a few main classifications of gated ion channels. There are voltage- gated ion channels, ligandgated, other gating systems and finally those that are classified differently, having more exotic characteristics. The first are voltage- gated ion channels which open and close in response to membrane potential. These are then separated into sodium, calcium, potassium, proton, transient receptor, and cyclic nucleotide-gated channels; each of which is responsible for a unique role. Ligand-gated ion channels are also known as ionotropic receptors, and they open in response to specific ligand molecules binding to the extracellular domain of the receptor protein. The other gated classifications include activation and inactivation by second messengers, inwardrectifier potassium channels, calcium-activated potassium channels, two-pore-domain potassium channels, light-gated channels, mechano-sensitive ion channels and cyclic nucleotide-gated channels. Finally, the other classifications are based on less normal characteristics such as two-pore channels, and transient receptor potential channels (2). BK channels contribute to electrical impulses, proper signal transmission of information and regulation of neurotransmitter release (3). A gain of function mutation in the pore-forming alpha subunit of the BK channel was linked to human neurological diseases. Findings suggest that the distribution of the beta subunits in the brain can modulate the BK channels to contribute to the pathophysiology of epilepsy and dyskinesia (4). This has major implications on other physiological processes in tissues other than the brain. Western Blot analysis of KCNMB2 expression in transfected 293T cell line (H00010242-T01) by KCNMB2 MaxPab polyclonal antibody.Lane 1: KCNMB2 transfected lysate(25.85 KDa).Lane 2: Non-transfected lysate. 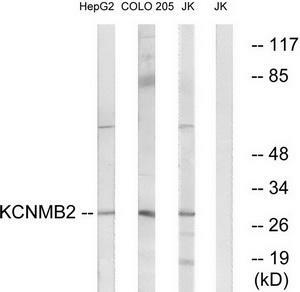 Western blot analysis of extracts from Jurkat/COLO/HepG2 cells, using KCNMB2 Antibody. The lane on the right is treated with the synthesized peptide. 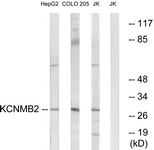 Western blot analysis of KCNMB2 expression in HepG2 (A) whole cell lysates. Immunoblot against extracts of COS cells transiently transfected with GFP-tagged BKBeta2 or untagged Kv2.1 plasmid and probed with N53/32 (left) or K89/41 (right) TC supe. 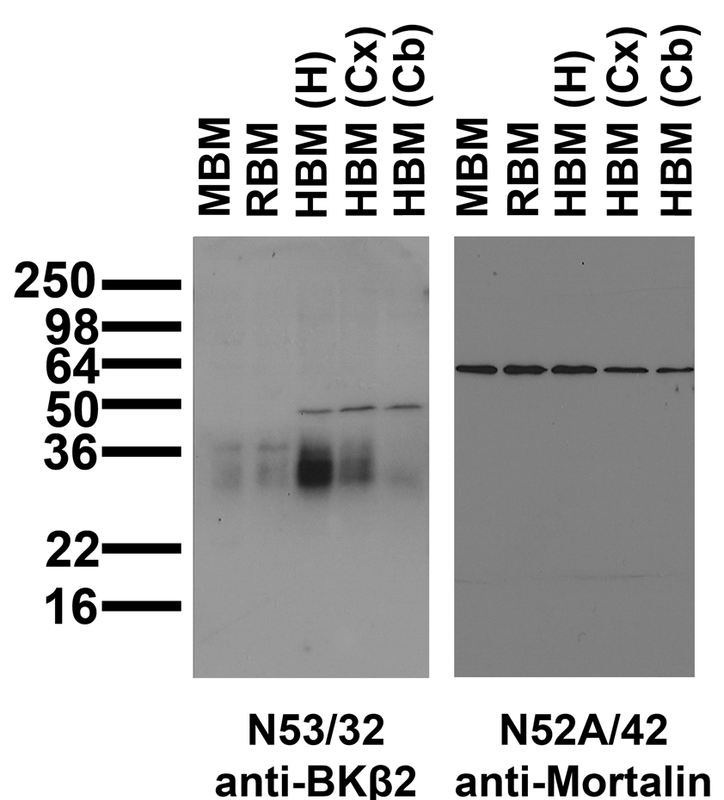 Immunoblot against crude membrane fractions from whole mouse (MBM) or rat (RBM) brain and from human hippocampus [HBM(H)], cerebral cortex [HBM(Cx)] or cerebellum [HBM(Cb)] and probed with N53/32 (left) or N52A/42 (right) TC supe. 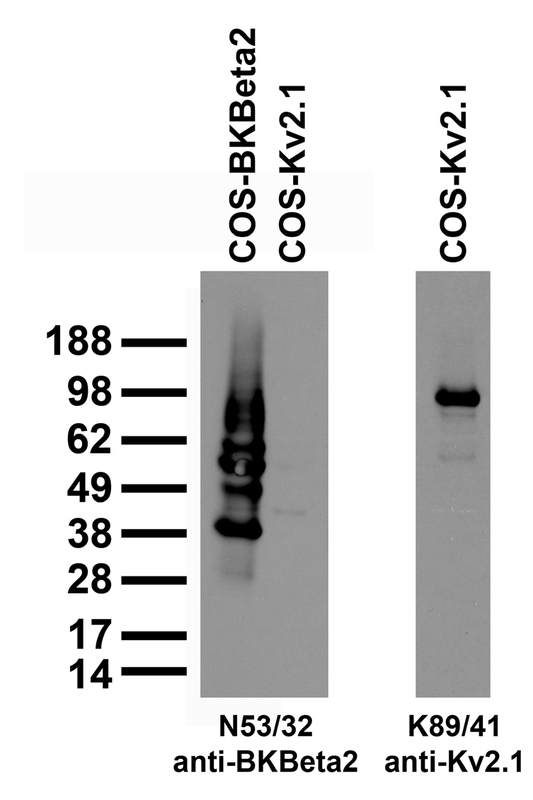 Western blot analysis of extracts from HepG2 cells, COLO cells and Jurkat cells, using KCNMB2 antibody.The lane on the right is treated with the synthesized peptide. Western blot analysis of rat kidney (lanes 1 and 3) and rat heart (lanes 2 and 4) membranes: 1, 2. Anti-sloß2 (KCNMB2) antibody, (1:200). 3, 4. Anti-sloß2(KCNMB2) antibody, preincubated with the control peptide antigen. Expression of sloß2 in rat hippocampus. Immunohistochemical staining of rat hippocampus using Anti-sloß2 (KCNMB2). A. sloß2 appears in the pyramidal layer (green). B. Staining of interneurons with mouse anti parvalbumin (PV, red). C. Confocal merge of sloß2 and PV demonstrates presence of sloß2 also in PV (GABA containing) cells (orange).